The new board will constitute the most politically experienced and ambitious group of county board members in memory. Indeed, the speeches by three newcomers given at the county's swearing-in ceremony last week sounded campaign ready, complete with applause lines. Multnomah County Commissioner Loretta Smith won't feel so alone in 2017. No longer will Smith, who is African-American, be the only minority member of the county board. Last week, two more representatives of ethnic minorities joined the five-member board— creating the first majority-minority board in the county's history. "It's going to be great," Smith said. "I'm not going to be the only one asking the questions around equity, and using the equity lens to create policies and identify where (the) public dollar goes." The new board, which will be composed entirely of women, also shows the increasing prominence of what was once considered a relatively low-profile job. Multnomah County board members make $100,945 a year, while the chair earns $169,774. "What is especially meaningful to me is that I am the first Asian-American ever to serve on the commission," Stegmann said to applause during the Jan. 3 event. "This is a milestone that's long overdue." The polish may be new, but it's not surprising as all five board members have either held or run for higher office, or are open to doing so in the future. The makeup of the board is significant because the county oversees important social services as well as law enforcement functions. And Multnomah County's $1.88 billion budget could soon be under threat thanks to a new federal administration and a budget-strapped state Legislature. The goal is to be a "uniquely effective board," says one of the newcomers, Jessica Vega Pederson. "I think all of our experiences and interests that we bring is going to help." Vega Pederson, a former technology company manager, represents county District 3, covering parts of East and Southeast Portland. Raised in a Mexican-American family in Indiana, she previously was the first Latina elected to the state House, serving two terms representing District 47. She replaced Judy Shiprack, a former lawmaker and prosecutor, on the county board. When women hold office, Vega Pederson said, "I think that in part you see a focus on different policies ... focusing on issues that are critical to women and their families." A sign of Vega Pederson's amibitions? Though she ran unopposed in the primary, she took the unusual step of using a public relations firm after her May election to try to set up get-togethers with local reporters. One invitation described her as a "rising star in the political world." Stegmann, representing the eastern part of the county in District 4, replaced Diane McKeel. An insurance agent, Stegmann served six years on the Gresham City Council. She was adopted from a Korean orphanage as an infant. She will represent another minority on the board, as well, as she's the only Republican on the nonpartisan board. She describes herself as part of an even smaller minority, a "progressive Republican" for whom social services are a priority. While she has not run for higher office before, she won't rule it out either. The third new board member, Sharon Meieran, ran unsuccessfully for the state House in 2012. She succeeds Jules Bailey to represent District 1, covering the western and southwestern parts of Portland. She is an emergency room doctor and former lawyer who has been active in advocating for mental health reforms and improved police oversight. 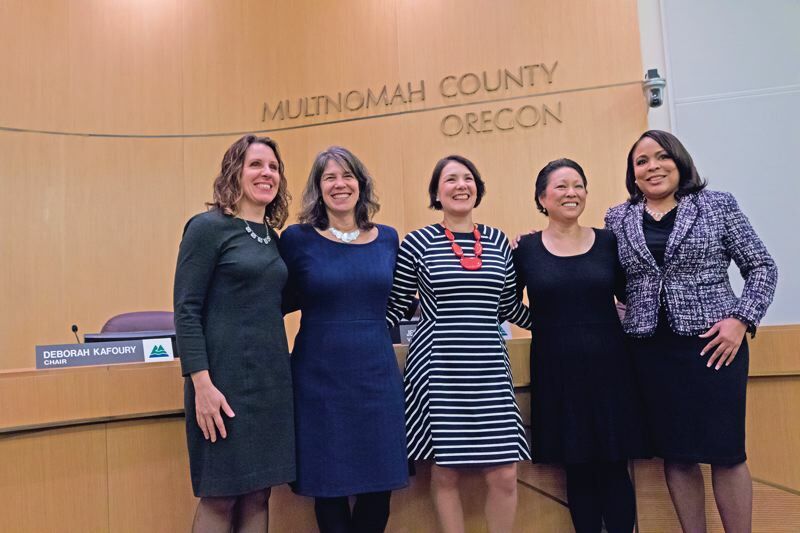 "I think that having this diverse board of women commissioners really just speaks to the values of the community, and we'll be able to reflect those in the decisions that we make," Meieran said. Kafoury, herself a former state lawmaker, said "I think it's exciting to have three new folks on the commission. They're not just any three people but three talented, dedicated, committed folks that bring with them their own focus and ideas." She added that the majority-minority makeup of the board will be important in light of heightened concerns about expected changes to policies on immigration and social services. "I don't know that our policies will be so different. I think it's more about how the community reacts to its elected officials," Kafoury said. "Whatever happens at the federal level, there's going to be people at the county level who have their backs."